I mentioned Tolstoy before, in my blog 479 about Self-knowledge; see also my blogs 482, 488 about truth. Leo Tolstoy (1828 - 1910), born to an aristocratic Russian family, was a champion of the truth and an advocate of peace and non-violence, even in the face of evil. 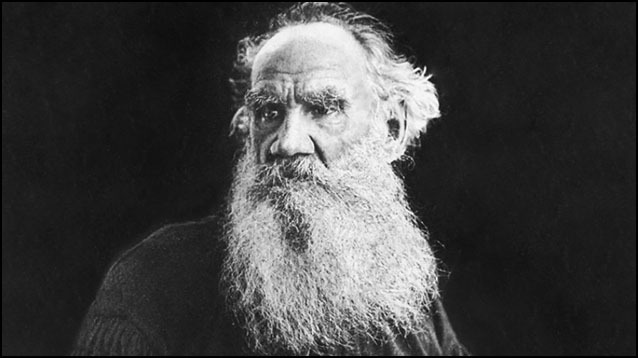 Tolstoy is best known for the novels War and Peace (1869) and Anna Karenina (1877). He wrote them with his wife Sonya as his secretary, editor, and financial manager. 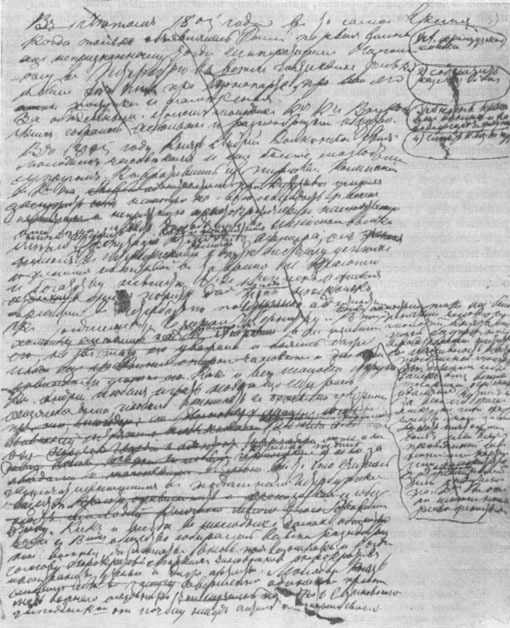 Sonya was copying and handwriting his epic works time after time (below a page from his ninth draft; incidentally, she also had 13 children with him). Tolstoy would continue editing War and Peace and had to have clean final drafts to be delivered to the publisher. I can't help myself, but I have to add a comment here: Can anyone imagine the magnitude of this task? They wrote the books by hand (in print 1440 pages, Book Depository), and his wife copied and edited this book - War and Peace - nine times! Furthermore, he wrote his second great opus a mere eight years after the first (and who knows how many pieces of writing in-between). Now, I write my book en.light.en.ment - of course - on the computer; I published it first in 2012. The current edition is no. 48. But I have made 328 revisions to date. I am in awe of this man and his wife (and for that matter, any writer of the pre-typewriter/pre-computer eras). In 1844, he began studying law and oriental languages, his teachers described him as "both unable and unwilling to learn." Tolstoy left the university in the middle of his studies and in 1851, after running up heavy gambling debts, he and his older brother joined the army. It was about this time that he started writing. Tolstoy was promoted to lieutenant for "outstanding bravery and courage". His conversion from a dissolute and privileged society author to the non-violent and spiritual anarchist of his latter days was brought about by his experience in the army. Tolstoy witnessed a public execution in Paris, a traumatic experience that would mark him for the rest of his life. Writing in a letter: "The truth is that the State is a conspiracy designed not only to exploit, but above all to corrupt its citizens ... henceforth, I shall never serve any government anywhere." Tolstoy's concept of non-violence was instilled in Mahatma Gandhi through his A Letter to a Hindu when young Gandhi corresponded with him seeking his advice. His European trip shaped both his political and literary development and Tolstoy wrote his educational notebooks. Fired up by enthusiasm, Tolstoy returned to Russia and founded 13 schools for the children of Russia's peasants, who had just been emancipated from serfdom in 1861. Tolstoy's educational experiments were short-lived, however, as a direct forerunner to A. S. Neill's Summerhill School, the school at Yasnaya Polyana can justifiably be claimed the first example of a coherent theory of democratic education. I am interested in these developments in view of my UNITY project. After reading Schopenhauer's The World as Will and Representation, Tolstoy gradually became converted to the ascetic morality upheld in that work as the proper spiritual path for the upper classes: "Do you know what this summer has meant for me? Constant raptures over Schopenhauer and a whole series of spiritual delights which I've never experienced before. ... no student has ever studied so much on his course, and learned so much, as I have this summer." But this very necessity of involuntary suffering (by poor people) for eternal salvation is also expressed by that utterance of the Savior (Matthew 19:24): "It is easier for a camel to go through the eye of a needle, than for a rich man to enter into the kingdom of God." Therefore those who were greatly in earnest about their eternal salvation, chose voluntary poverty when fate had denied this to them and they had been born in wealth. Thus Buddha Sakyamuni was born a prince, but voluntarily took to the mendicant's staff; and Francis of Assisi, the founder of the mendicant orders who, as a youngster at a ball, where the daughters of all the notabilities were sitting together, was asked: "Now Francis, will you not soon make your choice from these beauties?" and who replied: "I have made a far more beautiful choice!" "Whom?" "La povertà (poverty)": whereupon he abandoned every thing shortly afterwards and wandered through the land as a mendicant. In 1884, Tolstoy wrote a book called What I Believe, in which he openly confessed his Christian beliefs. He affirmed his belief in Jesus Christ's teachings and was particularly influenced by the Sermon on the Mount, and the injunction to turn the other cheek, which he understood as a "commandment of non-resistance to evil by force" and a doctrine of pacifism and nonviolence. In his work The Kingdom of God Is Within You, he explains that he considered a mistake the Church's doctrine because they had made a "perversion" of Christ's teachings. Tolstoy also received letters from American Quakers who introduced him to the non-violence writings of Quaker Christians such as George Fox, William Penn and Jonathan Dymond. Tolstoy believed being a Christian required him to be a pacifist; the consequences of being a pacifist, and the apparently inevitable waging of war by government, are the reason why he is considered a philosophical anarchist. Tolstoy believed that a true Christian could find lasting happiness by striving for inner self-perfection through following the Great Commandment of loving one's neighbor and God rather than looking outward to the Church or state for guidance. His belief in nonresistance when faced by conflict is another distinct attribute of his philosophy based on Christ's teachings. By directly influencing Mahatma Gandhi with this idea through his work The Kingdom of God Is Within You (full text of English translation available on Wikisource), Tolstoy's profound influence on the nonviolent resistance movement reverberates to this day. He believed that the aristocracy were a burden on the poor, and that the only solution to how we live together is through anarchism. Leo Tolstoy was never easy-going. Having built his own philosophical and religious system, Tolstoy fought anyone opposing it, including the state and the Russian Orthodox Church. No one could stop the redoubtable author. In 1884 he ironically asked his aunt to consider him a Muslim. He didn’t really convert to Islam; it was a way to emphasize Tolstoy’s loneliness and his endless conflicts in Russian society. “Liberals think of me as an insane man, radicals – a babbler mystique, the government considers me a dangerous revolutionary and the Church thinks I’m the Devil himself,” Tolstoy wrote. Back in the 1880s, Tolstoy who had already written his masterpieces War and Peace and Anna Karenina, now concentrated on philosophical writings and was extremely popular in Russia with hundreds of people adoring him (starting from the emperor Alexander III who called him “my Tolstoy”). Nevertheless, he sparked serious disputes in society as his views were radical and contradicted the official line of both government and church. Here are three holy wars that Leo Tolstoy, Russian “king of controversy”, took part in. In other words, the author was a self-consistent anarchist. As philologist Andrei Zorin pointed out, since Tolstoy’s childhood the whole idea of suppressing the individual (and power, even balanced and limited, does that) was violent and unacceptable for him. His humanism opposed any powers-that-be, thus making him a dangerous liberal for those in charge. Tolstoy believed that climbing to the top of the society required cunning and dirty tricks, so it’s the worst people who rule the world. At the same time, Tolstoy was never a revolutionary, as he did not believe in violent means. Although Vladimir Lenin, the future leader of the USSR, called Tolstoy “the mirror of the Russian revolution” for his description of deep contradictions in Russian society, he criticized the author for “incoherent” views and insufficient criticism of the government. Tolstoy didn’t care, preferring the spiritual to political life. But in this area he had even more serious conflicts. A believer all his life, from a certain point Tolstoy separated ways with the official Orthodoxy. Back in 1855 (in his twenties), he mentioned in his diary that his aim was to create a new religion – Christianity “purified” of mysticism. He and his supporters, believing in Christ and considering themselves Christians, called for focusing on living this life wisely and righteously, not waiting for the afterlife. Tolstoy advocated strict moral norms implied by the Church but denied miracles. For example, for him Christ hadn’t resurrected after being crucified in Jerusalem: he was only a righteous man, not a Son of God. Such an approach, “Christianity with no wonders,” triggered outrage among church officials. As it wasn’t enough, Tolstoy loved to criticize them harshly, calling Russian priests “self-confident but lost and poorly educated, dressing in silk and velvet.” To him, the Church corrupt with power and money, couldn’t be a moral authority and was only enslaving the peasants. The Church leaders spared no criticism towards Tolstoy. 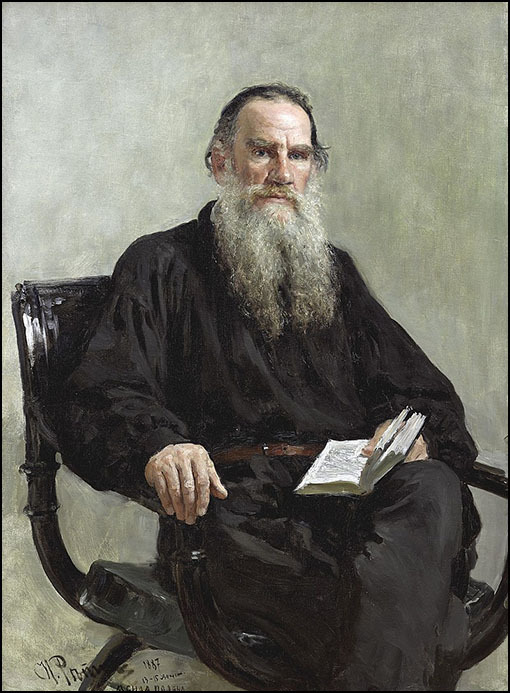 Presbyter John of Kronstadt, one of the most popular Christian preachers of those days (later canonized), described Tolstoy like this: “He perverted all the sense of Christianity… he laughs at Church with Satan’s laughter.” He even prayed for Tolstoy’s death in 1908. These anarcho-pacifist views along with his huge popularity and criticism of the priests led to Tolstoy's excommunication from the Russian Orthodox Church in 1901. Tolstoy recognized the act, agreeing that he disbelieved church dogmas and it would be hypocritical to be part of the Church. His excommunication remains valid in the Orthodox Church and no cross marks his grave. Unlike church and state, William Shakespeare, who also suffered from Tolstoy’s severe criticism couldn’t answer him for he had been dead since 1616. This, however, didn’t stop one of the greatest Russian writers from destroying (or, rather, trying to destroy) one of the most famous British. “There is no real human talk in his plays,” Tolstoy wrote in a big essay dedicated to Shakespeare’s heritage. He also expressed that he felt “irresistible repulsion and tedium” while reading the plays, no matter what language he tried - Russian, English or even German. It’s unlikely that Tolstoy thought that his criticism would undermine Shakespeare’s influence but he couldn’t help but write all in which he believed. Even while attacking plays of his fellow writer Anton Chekhov, count Tolstoy used Shakespeare as an example: “Anton Pavlovich, Shakespeare was a bad writer, and I consider your plays even worse.” History proved him wrong: both Chekhov and Shakespeare are still being staged throughout the world. When the first Nobel Prize winner, the French poet Rene Sully-Prudhomme, was announced in 1901, many of Tolstoy’s admirers were disappointed. This was especially true in the Swedish literature circle, where Tolstoy was considered as the ideal candidate for the award. Several years passed, but Tolstoy did not appear on the list of nominees. In 1906 the Academy of Sciences in St. Petersburg submitted an application in support of the author’s nomination. When Leo Tolstoy learned of the rumour that he should be the Nobel Laureate, he wrote a letter to Arvid Jarnefelt, his Finnish translator, asking him to remove his name from the list of nominees. He wrote that it would be extremely uncomfortable to have to reject the prize if he won. Jarnefelt sent a translation of the letter to the committee, and in the end, the Nobel Prize went to the Italian poet Carducci Geosue, who was only well-known amongst literary specialists.